Peter took hold of the lame man's right hand, and raised him up. OON AFTER JESUS was taken up into heaven, his disciples began to preach, as he had told them to do. They stood up in the streets, and in the Temple, and spoke to the people all the words that Jesus had given to them. And although they could no longer see Jesus, he was with them, and helped them, and gave them great power. The two apostles, Peter and John, were one day going up to the temple at the afternoon hour of prayer, about three o'clock. They walked across the court of the Gentiles, which was a large, open square paved with marble, having on its eastern side a double row of pillars with a roof above them, called Solomon's Porch. In front of this porch was the principal entrance to the Temple, through a gate which was called "The Beautiful Gate." In front of this gate they saw a lame man sitting. 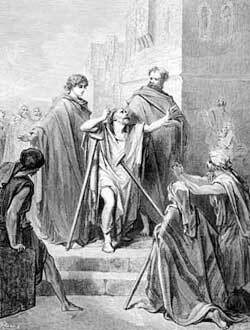 He was one who in all his life had never been able to walk; and as he was very poor, his friends carried him every day to this place; and there he sat, hoping that some of those who went into the Temple might take pity on him, and give him a little money. In front of this man Peter and John stopped; and Peter said: "Look at us!" "Silver and gold have I none; but what I have that I will give you. In the name of Jesus Christ of Nazareth, walk!" And Peter took hold of the lame man's right hand, and raised him up. At once the lame man felt a new power entering into his feet and ankle-bones. He leaped up, and stood upon his feet, and began to walk, as he had never done before in all his life. He walked up the steps with the two apostles, and went by their side into the Temple, walking, and leaping, and praising God. The people who now saw him leaping up and running knew him, for they had seen him every day sitting as a beggar at the Beautiful Gate: and every one was filled with wonder at the change which had come over him. After worshipping and praising God in the Temple, the man, still holding fast to Peter and John, went out with them through the Beautiful Gate, into Solomon's Porch. And in a very few minutes a great crowd of people were drawn together to the place to see the man who had been made well, and to see also the two men who had healed him. "Ye men of Israel," he said, "why do you look wondering on this man? or why do you fix your eyes upon us, as though by our own power or goodness we had made this man to walk? The God of Abraham, of Isaac, and of Jacob, has in this way shown the power and the glory of his Son Jesus, whom you gave up to his enemies, and whom you refused before Pontius Pilate, when Pilate was determined to set him free. But you refused the Holy One and the Righteous One, and chose a murderer, Barabbas, to be set free in his place; and you killed the Prince of Life, whom God raised from the dead. We who have seen him risen, declare that this is true. And the power of Jesus, through faith in his name, has made this man strong. Yes, it is faith in Christ that has given him this perfect soundness before you all. Now, my brothers, I am sure that you did not know that it was the Son of God and your own Saviour whom you sent to the cross. Therefore turn to God in sorrow for this great sin, and God will forgive you, and in his own time he will send again Jesus Christ. God, who has raised up his Son, is ready to bless you, and turn away every one of you from his sins." While Peter was speaking, the priests, and the captain of the Temple, and the rulers, came upon them; for they were angry as they heard Peter speak these words. They laid hold of Peter and John, and put them into the guardroom for the night. But many of those who had heard Peter speaking believed on Jesus, and sought the Lord; and the number of the followers of Christ rose from three thousand to five thousand. "By what power, or through whom have you done this?" "Ye rulers of the people and elders, if you are asking us about the good deed done to this man who was so helpless, how it was that he was made well, I will tell you that by the name of Jesus of Nazareth whom you put to death on the cross, whom God raised from the dead; even by him this man stands here before you all strong and well. And there is no salvation except through Jesus Christ, for there is no other name under heaven given among men that can save us from our sins." When these rulers saw how bold and strong were the words of Peter and John, they wondered, especially as they knew that they were plain men, not learned in books, and not used to speaking. They remembered that they had seen these men among the followers of Jesus, and they felt that in some way Jesus had given them his power. And as the man who had been healed was standing beside them, they could say nothing to deny that a wonderful work had been done. "What shall we do to these men? We cannot deny that a wonderful work has been done by them, for every one knows it. But we must stop this from spreading any more among the people. Let us command them not to speak to any man about the name of Jesus; and let us tell them, that if they do speak, we will punish them." So they called the two apostles into the room again, and said to them: "We forbid you to speak about Jesus, and the power of his name, to any man. If you do not stop talking about Jesus, we will lay hands on you, and put you in prison, and will have you beaten." But Peter and John answered the rulers: "Whether it is right to obey you or to obey God, you can judge. As for ourselves we cannot keep silent; we must speak of what we have seen and heard." The rulers were afraid to do any harm to Peter and John, because they knew that the people praised God for the good work that they had done; and they would be angry to have harm come to them. For fear of the people, they let them go. And being let go, they went to their own friends, the company who met in the upper room, and there they gave thanks to God for helping them to speak his word without fear.